View More In Houses & Habitats. 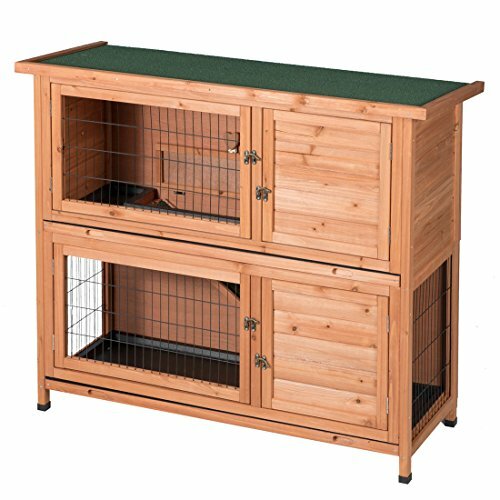 Hurry to find the most comfortable rabbit hutch for your lovely pet. Our wooden house is your best choice. This hutch is similar to a bunk bed as there are two cages stacked on each other. The house includes raised legs to keep it off the ground and makes it much more difficult for any other pests to be able to enter. The house has removable floors. It is easy for you to clean and saves a lot of time. The roof is asphalt shingled which is very durable and adds extra security. There are 2 doors of each cage , total of 4 doors. The doors all have locks to guarantee security. Most of all, the space is big enough for your lovely pet to rest and play. With its many excellent features, this house is really a good place to let your bunnies and other small animals live in!